Deep within the mountains of Rokugan reside the Dragon Clan. 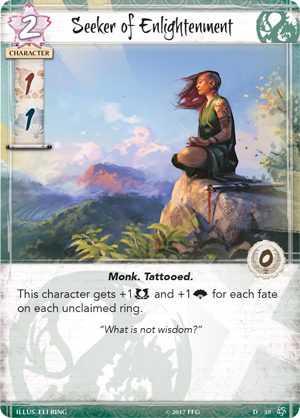 Enigmatic and mysterious, isolated by the mountains of their northern home and entrusted with watching over the Empire, few can anticipate the actions of these secluded warrior monks. Though when they do choose to intervene in the conflicts of the Emerald Empire, the Dragon's true strength is revealed. 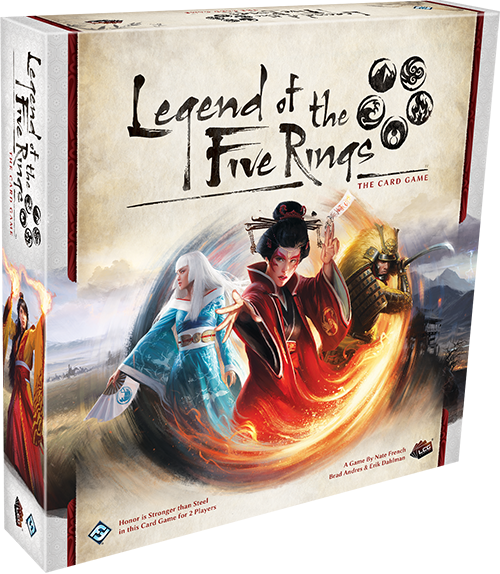 Today, we’re previewing the individualistic Dragon Clan in Legend of the Five Rings: The Card Game. The Dragon overwhelm their opponent through strong personalities with a wealth of powerful attachments, fate manipulation, and a balance between military and political skill. The Dragon are experts at manipulating fate, the Togashi Initiate (Core Set, 55) can place additional fate on rings, and characters like Seeker of Enlightenment (Core Set, 59) receive bonuses based on the number of fate on rings. But that’s not all the Dragon can do to manipulate the tides of fate. 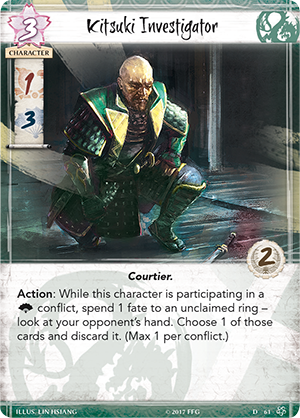 During a political conflict, the Kitsuki Investigator (Core Set, 61) can spend one fate to an unclaimed ring to look at an opponent’s hand and discard a card from it. 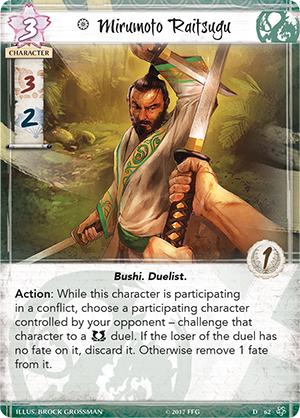 This can limit your opponent's actions during the conflict phase while also giving you a view of the tricks they have up their sleeve. 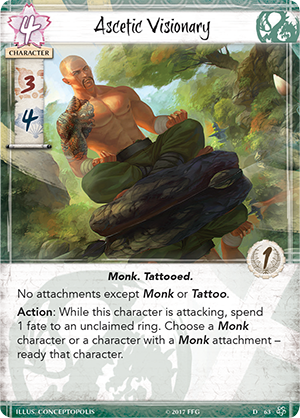 Meanwhile, the Ascetic Visionary (Core Set, 63) allows you to spend a fate to an unclaimed ring to ready a Monk or character with a Monk attachment during a conflict the Visionary is participating in. This can allow you to ready a character to either defend or to attack in your next conflict. Placing fate on rings is a powerful but risky proposition. While spending the fate can trigger powerful abilities, your opponent could declare a conflict of that ring type, claiming the fate you’ve spent to the ring. But Dragons have plans even if that should occur. 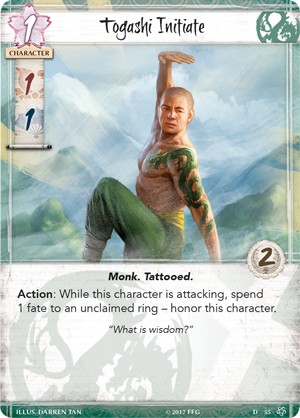 The Enlightened Warrior (Core Set, 60) receives one fate when your opponent selects a ring with fate on it, meaning your opponent is extending your warrior's time on the field the first time they select a ring with fate on it every turn. The Dragon Clan can also manipulate fate in more direct ways. Mirumoto Raitsugu (Core Set, 62) challenges characters to a military duel, with the loser losing a fate or being discarded from play if they have no fate on them. 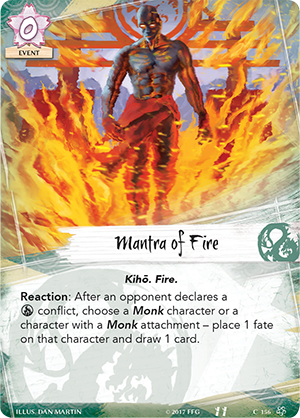 Furthermore, Mantra of Fire (Core Set, 156) allows you to both place a fate on a Monk character and draw a card after an opponent declares a fire conflict, further extending your character’s life span. These characters with plenty of extra fate are the perfect targets for Dragon’s myriad of attachments. 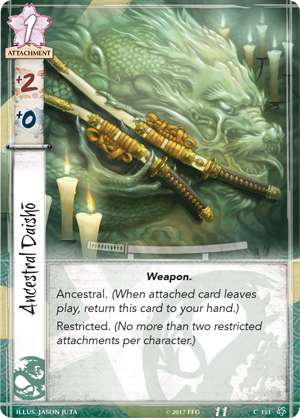 Ancestral Daishō ( Core Set, 151) and Kitsuki's Method (Core Set, 153) are two attachments that mirror each other by providing two military skill and two political skill, respectively. 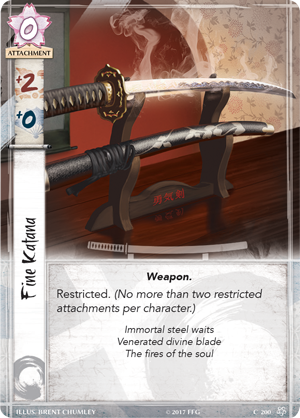 While these effects are similar to Fine Katana (Core Set, 200), they also contain the "Ancestral" keyword, allowing them to return to your hand even when the character they are attached to leaves play. Starting the game with a Kitsuki’s Method potentially means it will stay on the field or in your hand the entire game. 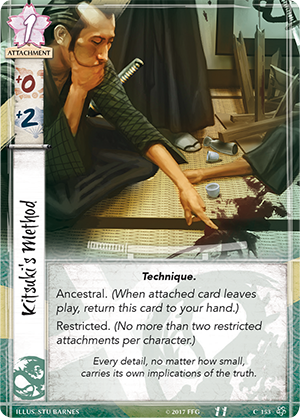 Weapons like the Ancestral Daishō and Fine Katana are deadly in the hands of a character like a Niten Master (Core Set, 64), who readies when a Weapon is attached to him, with a limit of twice per round. With this ability, not only can the Master participate in up to three conflicts a round, but also grow stronger through each battle as more and more Weapons are attached to him. The Dragon also use several unorthodox attachments. Togashi Kazue (Core Set, 150) can be played as a character, but achieves true potential when passing along her knowledge and assistance as an attachment. When attached to another character, Togashi Kazue can, as an action, move fate from an enemy to the attached character during a conflict in which they are both participating. This not only extends the time your character spends on the battlefield, but shortens the time an important foe will be around. 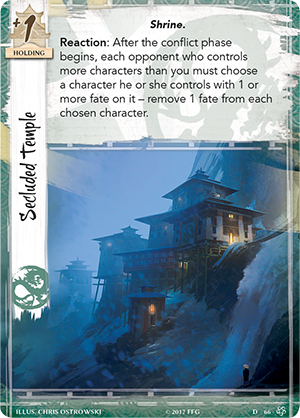 Fate can also be siphoned off your foes with the Secluded Temple (Core Set, 66), a holding that forces opponents with more characters than you to remove a fate from one of their characters at the start of the conflict phase. 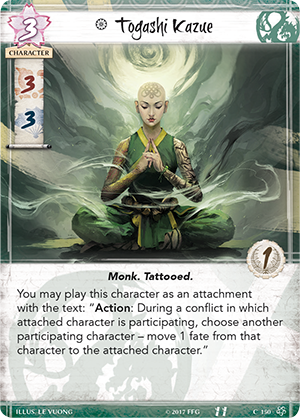 Like Togashi Kazue, Tattooed Wanderer (Core Set, 149) can also be played as a character or an attachment giving the equipped character the “covert” keyword. When you declare a conflict with a character with the covert keyword, you may pick a character without covert—that character cannot be declared as a defender in the conflict. This can allow your characters to sneak by a potential defender, and limit your opponent's options during a conflict. The Dragon exercise complete control over their attachments, whether by returning them to their hand via the ancestral keyword or having the choice to play them as characters. 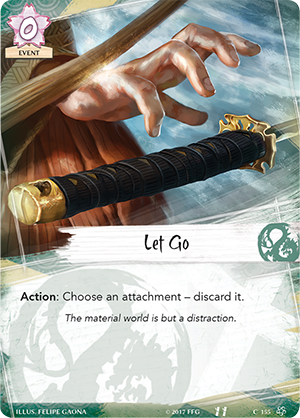 The Dragon also decide when it is time to Let Go (Core Set, 155), to discard their (or their opponent's) attachments to the physical world and become truly free. The Dragon’s attachments give them a huge advantage in battle and their stronghold of Mountain's Anvil Castle (Core Set, 3) further boosts their skills. During a conflict, bowing the castle gives a participating character with one or more attachments on it plus one military and plus one political skill. If that character has two or more attachments, they get plus two military and plus two political skill instead. This gives already strong Dragon characters an additional boost, and the ability to potentially break a province both politically and militarily. 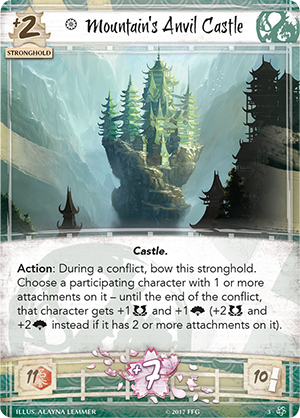 And like every other stronghold in the core set, Mountain’s Anvil Castle provides seven fate per turn and has an influence value of ten. 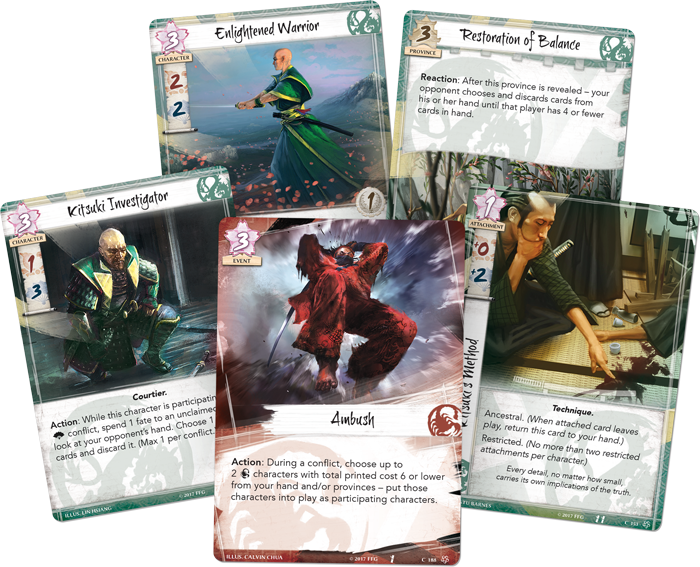 The Dragon begin the game with eleven honor, which is around the average value found in Legend of the Five Rings: The Card Game Core Set. 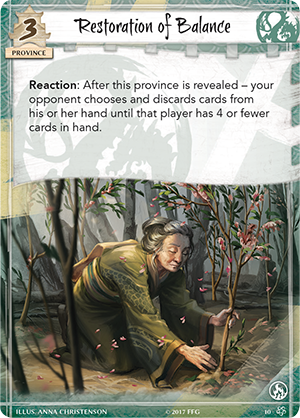 The Dragon province Restoration of Balance (Core Set, 10) allows them some level of control over their opponent’s hand of conflict cards. When it is revealed, Restoration of Balance forces your opponent to discard cards from their hand until they have four or fewer cards, reducing their hand size to what they began with at the start of the game. 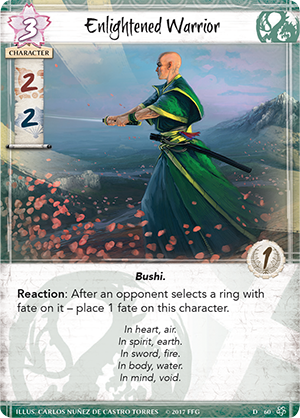 Of all the Clan Champions, Togashi Yokuni (Core Set, 65) is the most enigmatic. Guided by mysterious visions and offering cryptic commands, even the Dragon Clan itself have trouble interpreting the plans of their leader. But they trust in Togashi Yokuni to lead them to salvation. 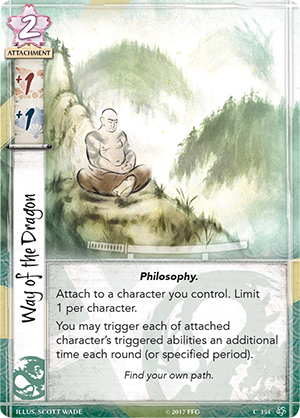 Togashi Yokuni represents the balance found in the Dragon Clan—with five military skill and five political skill, Yokuni is one of the more versatile champions found in the Legend of the Five Rings: The Card Game Core Set. With three glory, these stats could be boosted to eight military skill and eight political skill, making Yokuni a force to be reckoned with in any conflict. The mysterious Yokuni also has an action that allows him to copy another ability on the field. This can allow you to turn your opponent’s tactics against them or duplicate one of your own abilities, like the one found on Togashi Initiate. 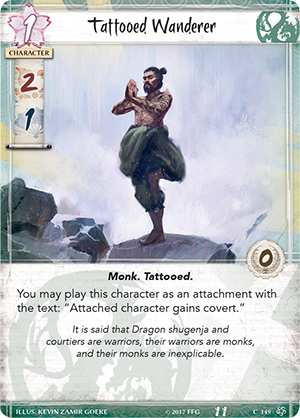 Attaching Yokuni with the Way of the Dragon (Core Set, 154) will let him use a copied ability a second time, giving him the edge over whomever he mimics. With powerful attachments and the ability to manipulate fate on the field, the Dragon Clan are a commanding force that few truly understand. 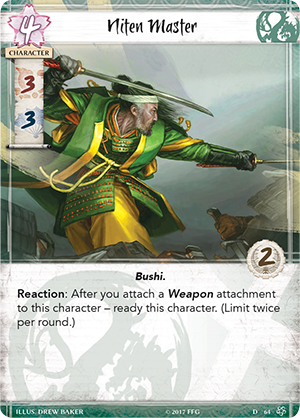 Join us this Friday, June 30th, at 11 a.m. central on the Fantasy Flight Games Facebook Page for another episode of L5R Live. Be sure to ask questions on Twitter with the hashtag #L5RLIVE or in our community forum for a chance to have them answered live on air! 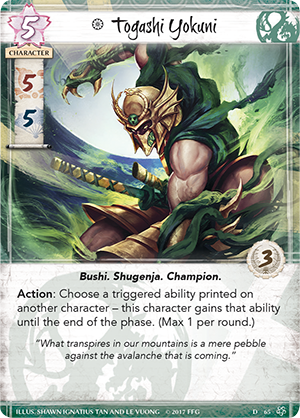 Find your balance and purchase Legend of the Five Rings: The Card Game (L5C01) at Gen Con 2017 or from your local retailer when it releases in the fourth quarter of 2017!